As businesses generate and manage vast amounts of data, companies have more opportunities to gather data, incorporate insights into business strategy and continuously expand access to data across the organisation. Doing so effectively—leveraging data for strategic objectives—is often easier said than done, however. 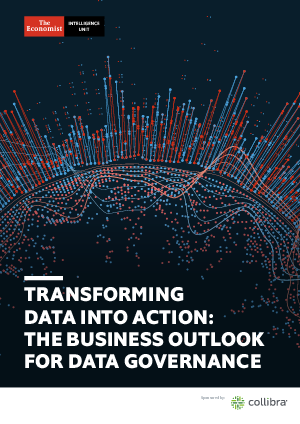 This report, Transforming data into action: the business outlook for data governance, explores the business contributions of data governance at organisations globally and across industries, the challenges faced in creating useful data governance policies and the opportunities to improve such programmes. This report, developed by The Economist Intelligence Unit and sponsored by Collibra, draws on a survey of more than 500 business executives working in North America and Europe in the financial services, healthcare and life sciences, manufacturing, retail and consumer packaged goods, telecommunications and technology industries. Joe Cahill was the author of the report; Michael Hoffmann was the editor.